There’s a holiday for everything. Even a number 2 pencil. Sometimes you need to just challenge yourself, if you know what I mean. I haven’t ever tried to *just* use a No. 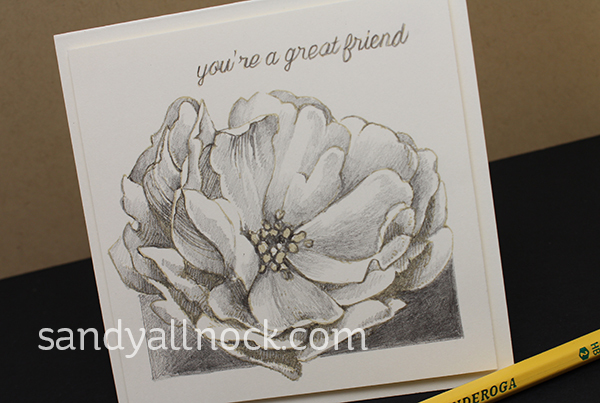 2 pencil on a stamped card on natural white cardstock – so the holiday is the perfect time to try it out! Use whatever light ink you have on hand – it’s a fun challenge! Just be sure you don’t let anyone think you drew it without a stamp. Well, unless you’re a rockstar and you DO draw it without the stamp! ha! Watch the video below or click HERE to see it in HD on YouTube. The card is very simple – a square card, with the panel popped. Simple, elegant, and shows off the pencil sketching! By the way if you want to be encouraged – go read the comments on Monday’s video! Oh my. The studio tour mini-rant seems to have released a lot of people from the little green monster. I am SO tickled! National Pencil Day – who knew, but I’m glad there is such a day! That is a gorgeous Rose! I did go back to your craft room video and saw all the comments that have been written. So glad that we are all confident in being who we are! I love using just pencil. Our whole first semester we had to only use pencil. I thought I would hate it but I came to love the way the shadows and different strokes made such beautiful art. I love this so much. I think a pencil picture is like a black and white photograph, you can actually feel the subject without any frills distracting you. Oh, geez. You mean all I need is stamp and a pencil? Please don’t let that info be too widely known. This is just so great, what a wonderful idea! What a great way to work on one’s pencil skills! This is why I just love your blog…serious…what you did with a number 2 pencil…yes of course there is the stamp…but still…so amazing!!! You really encourage everyone to do what we can with what we have!!! You rock!! “I, Pencil” is a short paper “authored” by a yellow number 2 pencil. You can find a copy online. An interesting perspective to a humble part of our lives. Now what you do with the humble no. 2 pencil is not only interesting but beautiful. 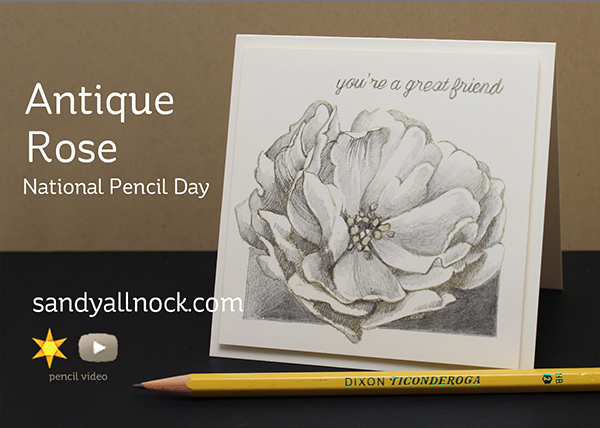 Only you can make a #2 pencil a beautiful art tool! Thanks for sharing. How do you do it? Most impressive! The video was so fast it made it look like a machine doing the coloring! Cool. I think this card is stunning! Thanks for sharing your talent with us. One question, did you worry about smearing? Did you spray anything on it to protect it? You never cease to amaze!! Love the reminder to take a second look at how to use your stamps and/or everyday tools to make beautiful art. I love the look of pencils – it has that charming sketchy look that makes it seem like it was effortless, even though it probably took quite a while to get right. Awesome, I’m so in awed by your talents!! Thanks for sharing. I’m going to give it a try!! Absolutely beautiful. Thank you Sandy!